Do you think you've got an aggressive puppy on your hands? Occasionally, that IS the reality, but 99% of the time what you interpret as puppy aggression is simply normal puppy behavior. ALL puppies nip, bite and growl. It's how they communicate with other puppies and dogs.... and this behavior plays an important role in their social development. Basically, your puppy is speaking 'dog' and you're speaking 'human'! But even though it's normal, this type of puppy behavior isn't always acceptable, and if Fido is acting 'aggressively', it's up to you to teach him how to express himself without using his teeth! 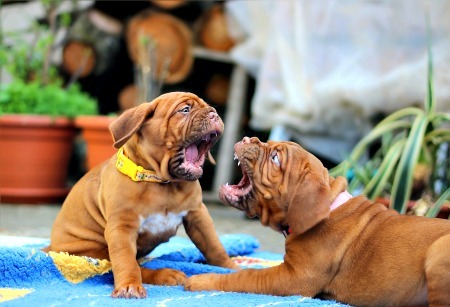 What causes aggressive behavior in puppies? Normal Puppy Or Aggressive Puppy? A puppy who nips and bites at your hands, clothes and feet is just following his natural instincts. This is how puppies play, interact and determine pack structure. A pup who barks for attention, or gives little low growls when he's tugging on his toys and playing with you or other pets is expressing himself normally, in the only way he knows how. The little guy who's chasing after your pants legs while nipping at your heels, or who keeps trying to round up the kids or the cat? 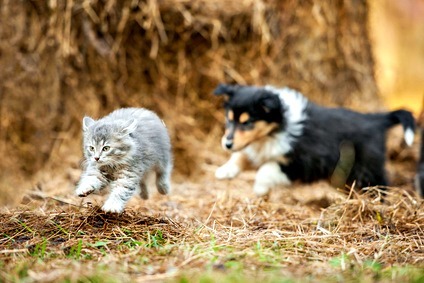 He's simply following his herding instincts. You have nothing to worry about with these types of behavior, they do NOT mean that you have an aggressive puppy. If you start working on some basic puppy training you'll soon have little Fido behaving in a much more humanly-acceptable way. 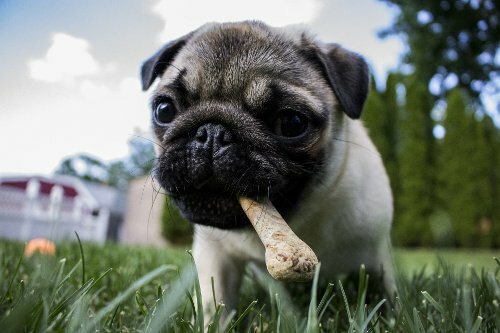 If your puppy is moving out of the 'baby' puppy stage and into adolescence, it's not unusual for his behavior to change. This might be seen as an emergence of 'aggression' but is really just normal teenage angst. However it does need to be handled properly if you want your pup to grow up to be a happy, well-balanced adult dog. What Makes A Puppy Aggressive? A puppy might be aggressive because of his genetic make-up. It might be that his mom or dad (or both) had dominant/aggressive or fearful/aggressive personalities and this can be an inherited trait. Personality also plays a role and puppies who are especially dominant can be overly 'bossy' (bordering on aggressive) in their desire to be 'top dog'. 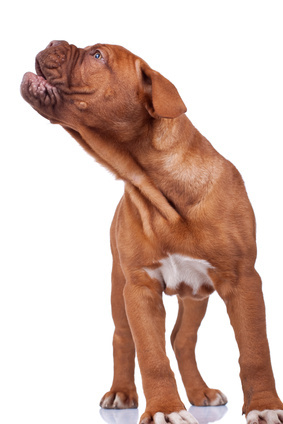 Occasionally a neurological problem, disease or other health condition can cause a puppy (or dog) to be aggressive. Treating the underlying condition will usually reduce, or even eliminate, the undesirable behavior but if there is a serious neurological issue it may not be treatable, but this is very rare. So can pain. Depending on the cause, this type of aggression may be treatable or at least manageable. Only a vet can make an accurate diagnosis in this type of situation. It's also possible for a puppy to learn aggressive behavior from his momma or other dogs who are his companions during the early weeks/months when he's developing and trying to understand his world and how to behave. Aggression as a learned behavior can also be a result of bad dog/human interactions. 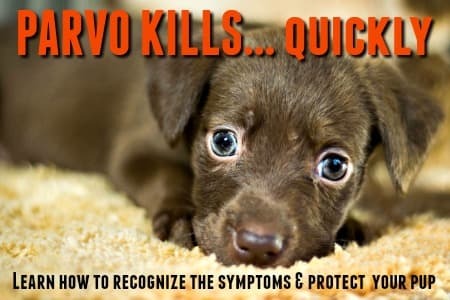 If an average puppy is abused, deprived or mistreated by his owner, in some cases he'll eventually try to protect himself from more pain/fear with aggressive actions. It's a classic example of the 'the best defense is a good offense' and is one form of fear-based aggression. A naturally anxious/fearful or dominant puppy is more likely to show these behavior changes in this situation. Many breeds such as the Rottweiler, Pitbull, German Shepherd Dog, Doberman Pinscher etc. are frequently misrepresented and misunderstood. This creates fear and distrust. Puppies of these breeds are most likely to be labeled 'aggressive' (most of the time incorrectly), because people have come to believe the hype and expect the worst..... often misinterpreting perfectly normal puppy behavior. If a pup uses his voice or teeth to protect his food/toys/treats from other puppies (or people) this is called Resource Guarding. It's most often seen in puppies who come from very large litters where there was a lot of squabbling over who got what, or in those who didn't have much in the way of food or other resources and so had to fight for every thing. If your puppy is from one of the guardian breeds or the 'bully breeds' he'll have an inbuilt instinct to guard or a natural tendency towards playing rough, or to be wary of other dogs. These are breed specific traits, developed due to the generation-after-generation practice of selecting breeding dogs with those exact characteristics. However, this doesn't make them aggressive dogs, or produce aggressive puppies! As you've read above, there isn't just one type of canine aggression. Aggressive behavior comes in different forms and appears for different reasons. Some of them can be potentially dangerous, others are normal behaviors which need to be re-shaped or a result of personality, circumstances or health. 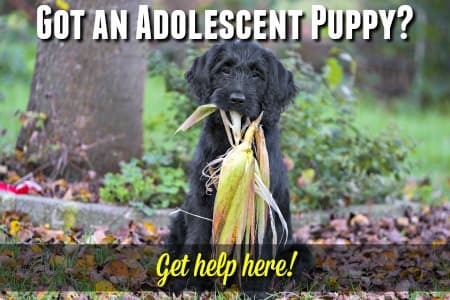 Of course all of them need to be discouraged so that your pup will grow up to be friendly, confident, tolerant and well-adjusted. Keep reading to learn about the most common types of aggression in puppies and how to handle each one properly. 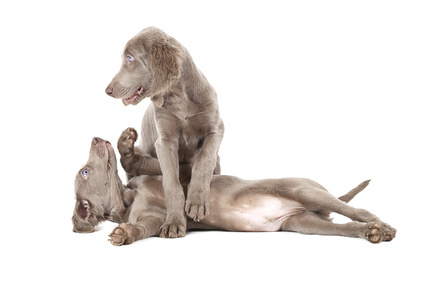 Puppy littermates squabble and fight in the same way that human siblings do. However instead of expressing it by squealing, crying, hitting or pushing they express it by nipping, biting and growling. If you watch a litter of puppies for more than a couple of minutes you'll see that a lot of this goes on, pretty much all the time. This is not aggression, it's totally normal canine behavior. Sometimes this rivalry is over food, or toys, treats or attention. Other times it's purely a personality conflict, or because a puppy is extra bossy. When puppies interact in this way how much they can push around a sibling before said sibling takes revenge. Dogs are pack animals and this is one of the ways that they establish hierarchy in the family pack (strength of personality and physical strength wins). It's also one of the ways in which puppies learn bite-inhibition because they learn how hard they can nip before getting bitten back. If a puppy gets too sassy with their momma she may growl, maybe give a quick nip, or grab him by the scruff of the neck or hold him down with her paw for a few seconds. This too is normal, natural canine behavior and is an important part of a puppys' education. Puppies taken from their doggie families prior to 8 weeks often bite/nip more and have poorer dog-to-dog social skills because they missed learning these vital lessons from their momma and littermates. A dominant or 'pushy' pup wants to be in charge and in control at all times. Not just of himself either, he wants to be the BOSS of everyone! Within a litter of puppies there is always going to be a range of personalities. Some pups will be outgoing, confident and friendly, others might be shy, even nervous. Then there's be the dominant (also often called the 'Alpha') pup, he's the one who wants to rule the roost. Dominance doesn't necessarily mean aggression though. With the right care and training and lots of love (plus a healthy dose of loving discipline) most bossy, stubborn puppies grow up to be happy, confident and social dogs. 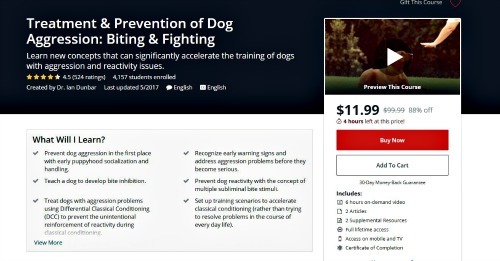 But if a naturally dominant pup doesn't get the training, socialization and love that he needs or if he's allowed to 'lay down the law', then things can get out of hand a he can become an aggressive puppy, and eventually an out-of-control dog. 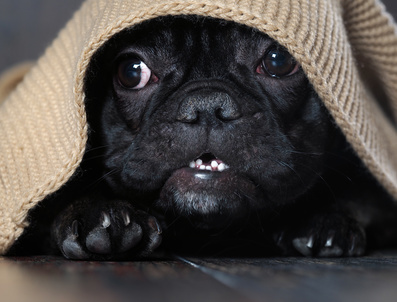 Nervous, shy or fearful puppies can be hyper-reactive to the world around them. They might be afraid of cars, people they don't know, cats, other dogs, loud noises, loud voices, being touched, fast-moving objects (including your hands)... and on and on. When he's scared of something or feels cornered or threatened, a pup like this is likely to react aggressively by growling, snapping or even biting. The depth of his fear makes him unpredictable and that's why this is perhaps the most dangerous type of puppy aggression. A puppy who is nervous or extra-shy needs lots of positive socialization experiences to help him learn to feel safe in the world and to grow in self-confidence. You'll need to be patient and understanding and help him push through his boundaries slowly and carefully. With a calm, yet positive and upbeat, environment, a predictable daily routine, positive puppy training techniques, and lots of love an anxious pup can grow into a confident happy dog who enjoys life to the full. This is when your puppy wants to protect his stuff from everyone - including you! Puppies from large litters, those who haven't had the best start in life, or the more dominant pups are more likely to act this way, but ANY puppy can be jealous and not want to share. You're most likely to see this type of aggressive puppy behavior when there's food involved... whether it's his regular kibble, a yummy treat, his favorite bone or some tasty morsel he's stolen from the trash can or picked up off the floor. This sort of aggression is one of the ones which can be potentially dangerous. This is because although it may start out as only appearing when someone tries to take something away from your pup, it could possibly escalate to the point where no one can walk past him when he has a toy/treat, without being growled at or threatened. The best way to prevent (or correct) resource guarding is to make 'Leave It!' one of the first dog commands he learns. Once your little guy has mastered this, you should be able to take anything from him without a problem - and so should anyone else. It's not an overnight-fix because depending on how serious your pup is about protecting his stuff he may need a LOT of practice, but if you're patient and consistent you will get there. When your new puppy chases the cat, the kids, a remote-control car, bikes, cars, the neighbors pet rabbit and just about anything else that moves, he's not being an aggressive puppy... it's just his inbuilt prey drive that's to blame. In the wild, canines hunt (think wolves, coyotes, foxes..), and they stalk, chase, catch and kill small, fast moving animals. Your pup doesn't need to go out and catch his own breakfast, but he does have a very deep-seated instinct to chase small, fast moving objects. If they're making a high-pitched noise they're even more attractive to him, which is why young children are often the target of his attention! Now your pup isn't going to try to kill and eat your kids or the mailman's bicycle, but depending on what his 'job' his breed was designed to do he may kill the rabbit! Terriers who were bred to hunt vermin aren't a good choice around small animals, neither are Hounds or Wolf-hybrids. Bulldogs and other breeds designed to chase and bring down large animals/game are more likely to chase horses, cows and cars. Although not the same as prey-drive aggression, herding dogs love to chase and nip at your heels, they're actually herding you which is what they've been bred to do. If you have a prey-drive-aggressive puppy, consistent corrections are a must. Always give him a firm verbal 'NO' when he starts to chase something. If you're out walking or outdoors, he should always be on a leash and you can use that to give him a quick 'pop' (or tug) in conjunction with the verbal correction. For indoors (if he's always chasing the cat or the kids for example) I'd recommend attaching a short leather training leash (aka a 'pull-tab' leash) to his regular collar so that you can grab hold of it for the 'pop' - without having him running around the house with a long trailing leash which is dangerous. Puppies are always learning, and while they're learning it's natural for them to make mistakes... this also means it's normal for them to be getting told 'no' and being corrected fairly frequently! BUT using harsh, punitive, physical punishments or a lot of yelling, shouting or gesticulating is a huge no-no. Firstly, this type of behavior doesn't really teach a puppy anything, except that humans are unpredictable and frightening. Secondly, if you repeatedly correct your pup by shouting at him, smacking him (even if you think it's 'only a slap' or a rap on the nose with a rolled up newspaper), pointing your finger at him or waving it in his face, or using the 'alpha roll' technique etc.. he's going to get scared or scared AND angry. Then you're going to have a punishment-aggressive puppy on your hands. Some breeds, and some individual puppies will tolerate this type of aggressive, abusive behavior (and that's what it is), perhaps indefinitely, but they won't be happy, confident puppies - or dogs. Others will react with stubbornness or even defiance, eventually coming back at you in the same tone, and that is never good. So, always use positive, rewards based training methods, be patient and consistent, and give your pup a chance to learn what you want from him without threats or intimidation. You'll all be happier with the results. There are other types of aggression that your puppy might show as he matures. These tend to be related to developmental stages. When your little puppy becomes an adolescent, he'll suddenly have all sorts of new feelings and desires to deal with. 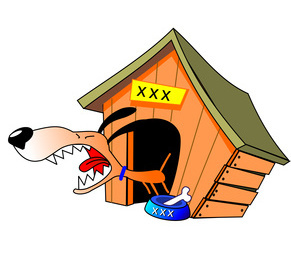 Sexual maturity leads to the need to chase after female dogs who are in season and fight with other male dogs who may be involved in the same pursuit! There's also the emerging instinct to guard and protect their home and family, this is territorial aggression. Just about every dog has this type of 'aggression' to some degree and it's not necessarily bad.. unless it's excessive or uncontrolled. 'Guardian breeds' have a more highly-developed instinct to protect and defend, so puppies of these type often need recognizable guidelines for their behavior. These are instinctual behaviors and your pup is likely to be confused by these feelings at first, not knowing what to do about them and this can cause a kind of split-personality behavior. For example, your pup may suddenly see visitors to your home as some kind of threat, so he'll want to bark at them. But, he's still a bit nervous about people he doesn't know and runs to you for reassurance. So now you have a pup who's peeking out from behind your legs and barking furiously at your cousin! This is funny, and perfectly normal for his age. To help your pup deal with these feelings you need to encourage him when he behaves appropriately and correct him when he doesn't - and do this regularly. Using the short training leash when you're at home can help with corrections. Also, be sure to be calm and in control when you're dealing with this 'aggressive' puppy behavior. Your pup needs to know you are in charge and that you're not worried (because he IS), he'll take his cue from you and will feel calmer and more confident if you're calm and confident. Formal puppy training lessons are helpful in preventing and dealing with this sort of pseudo aggressive puppy behavior because they give him lots of socialization in a controlled environment.. and give you access to hands-on professional help if you need it. Some breeds are more prone to being dog-aggressive than others. These may include bully breeds and guardian breeds, plus individual dogs can be show dog-aggressive tendencies due to their personalities. You rarely see a dog aggressive puppy, because most puppies will play happily with other puppies, and dogs of all ages, without issues. Some play-fighting, biting and general rough-housing between them is normal, true aggression is not. But as your sweet little puppy matures and becomes an adolescent and then an adult, he can become much more protective, defensive, dominant and even aggressive. 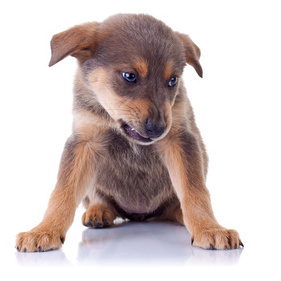 Barking, growling, snarling, lunging and even biting at other dogs is NEVER acceptable and you'll need to work hard to correct this aggressive puppy behavior if you see it developing in your little guy. Catching and discouraging it early is much better than trying to deal with a possessive, aggressive adult dog. Regular positive socialization from the time your pup is young is also a good way to head off or at least minimize the risk of your pup becoming dog-aggressive later on. As before, verbal corrections in conjunction with a leash correction is a good attention-getter, and formal dog training lessons are also useful in preventing this attitude, or learning how to deal with it when it shows up. Chances are excellent that your puppy (even if he's a bossy/dominant pup), won't become an aggressive puppy. Don't play tug-of-war or rough-house with a puppy who is dominant or pushy. Enroll him in at least one course of formal obedience training classes (and actually complete it!) . If you've read this whole page and understand what normal puppy behavior looks like, but are still worried that you have an aggressive puppy whose behavior is outside of normal limits, then you need to get some professional help. Dealing with a pushy, dominant pup or one who has a tendency towards being 'touchy' or lashing out when scared, angry or hurt is manageable for many experienced dog owners. But if you're a first-time puppy owner or haven't ever owned a pushy 'Alpha', or even slightly aggressive, pup then it's best to get some hands-on help and advice right away. Puppy aggression can almost always be discouraged and eliminated if it's handled properly, but if an aggressive puppy's behavior isn't reshaped when he's young, it can lead to serious problems later on. Many puppy owners have the same worries and concerns as you do, and it always helps to know you're not alone. Dr Ian Dunbar is a world-renowned veterinarian, animal behaviorist, dog trainer and author. He literally 'wrote the (first) book' on puppy training. He uses his decades of experience and education to help dog and puppy owners handle all aspects of training and behavior issues in the best possible way. In addition to his best-selling books and videos, you can now get help from this incredibly knowledgeable professional through Udemy, which provides online access to a whole host of educational courses, seminars, workshops and more. 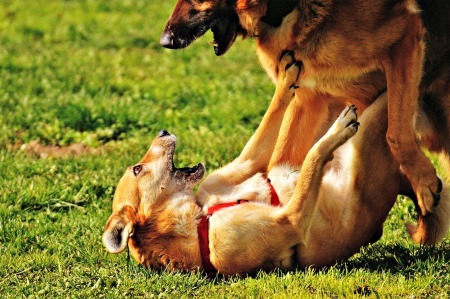 If you have a pup/dog who is already 'growl-y' or reactive around other dogs or in certain situations, then Dr. Dunbars' 'Biting & Fighting' course could be just what you need. Click on the image below to learn more, no obligation to buy, just information!